In September 1991 two German walkers trekking along the mountain chain that divides Austria from the western part of the Italian South Tyrol stumbled on a body in a pool of half frozen water formed by the melting of the glacier. At first the cadaver was presumed to be the remains of a modern alpinist. By chance, a couple of days later the famous local climbers Hans Kammerlander and Reinhold Messner passed by this way. Both had encountered their share of bodies of frozen climbers on their many ascents around the world and were immediately convinced that these remains must be older than suggested. But not even their experienced eyes could have predicted what subsequent scientific investigations carried out at Innsbruck were to establish: that the Iceman, or Similaun Man as he has also been dubbed after the neighbouring 3600-meter peak, had died about 5300 years ago. The Iceman's unprecedented state of preservation was thanks to the fact that after he died, very possibly following a fall in which several of his ribs were broken, his body was freeze-dried by the sub-zero temperature and the powerful action of the wind, and then buried under a protective layer of snow and ice. This icy grave protected the remains for over 5000 years until the gradual retreat of the glacier and an exceptionally warm summer in 1991 exposed them again. At first it appeared the iceman was naked, but it soon emerged that before he was buried by snow the withering winds that buffet these mountain tops had gradually tugged off his clothes and scattered them over an area of several meters. The recovery of these clothes revealed that the Iceman was actually very adequately equipped for high altitudes, with a neatly-sewn sheepskin jacket, leggings and hat, a tough woven-grass overcape to ward off rain and snow, and robust skin shoes stuffed with grasses to provide insulation. But for the mishap that overtook him, there was no reason why he should not have reached his destination safely. At the time of the discovery surprise was expressed that prehistoric man should have ventured onto seemingly so remote and hostile heights. One explanation, that he was some kind of maverick hunter in search of game, is unlikely, given that although he was carrying a copper-headed axe, of the dozen arrows in his quiver only two were ready for use with flights and tips in place, and the long-bow he was carrying was also still being worked on and lacked notches to attach a string. Having originally been claimed by Austria the Iceman who, it turned out, was lying on the Italian side of the frontier, was handed back to Italy this spring and transported to the excellent new South Tyrol Museum of Archeology in Bozen (Bolzano), where the remains are now kept in a specially-designed refrigerated chamber at minus 6C and 100 per cent humidity, reproducing the conditions that preserved them for over five millennia. The body can be viewed through a small window, and the Iceman's clothes and other possessions are also on display, along with a splendid reconstruction of him, even his face having been meticulously recreated using the latest forensic-medical techniques. The discovery of the Iceman and recent advances in Alpine archeology have begun to show that human habitation and activity in high places was earlier and more widespread than was once thought. Analysis of the Iceman's equipment and, for example, pollen samples suggest that he was a native of Vinschgau, the broad valley that runs from Meran towards Switzerland, off which branches Schnalstal, a narrow valley, in places a dramatic ravine, that leads up to the slopes of Similaun. Excavations a decade ago around Schloss Juval, a medieval castle on a pinnacle at the junction of Vinschgau and Schnalsertal, which is now the summer home of Reinhold Messner, unearthed evidence of a prehistoric settlement contemporaneous with the Iceman's era, and he may have been connected with this or a similar community. More intriguing still is the theory that he may have been a shepherd, since Schnalstal is even today the scene of a transhumance that has been going on for hundreds, perhaps, as now seems possible, thousands of years. 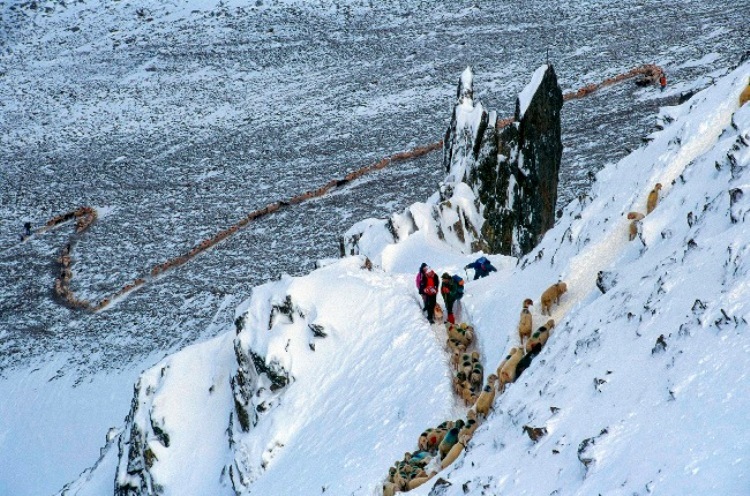 So, after I had visited the Iceman in Bozen, the suggestion of my friend Othmar Seehauser, the South Tyrolese photographer, that we follow the annual migration of sheep which passes close to the spot where the Iceman was found, was irresistible. Twenty-two farmers in Schnalstal own between them the grazing rights to the pastures of Niedertal to the north of Similaun - the present rights going back, according to Konrad Goetsch, the grazers's president, to the early 15th century. The fact that, since Italy's annexation of the South Tyrol after the First World War, the grazers are now in Italy and the pastures in Austria has fortunately not impeded the continuation of the age-old rite. Apart from the sheep owned by the Schnalstal farmers, the herds of a further 30 or so rent-paying sheepowners also join the migration - the total number of sheep making the journey this year amounting to over 1,900. The sheep and the score of shepherds driving them gather in early-to-mid June at 1700 meters on the lakeside hamlet of Vernagt at the foot of Similaun (the return at the end of the season occurring in September when the going is less arduous because there is much less snow). This year the date for the migration is fixed for 12 June, and when I arrive in Vernagt on the evening before, the sheep are already divided into groups in a series of pens, and most of the shepherds have retired to the next-door Edelweiss Gasthof to get some serious drinking in before the pre-dawn departure. Some of the shepherds have already been driving their sheep for two days to reach the meeting point and the partying when they get there is obviously an important and eagerly-awaited part of the ancient ritual. By nightfall snow is falling on Vernagt, though not settling, but after several storms in the days before, the word is that there is an unusually large quantity of fresh snow on the mountainside to be assaulted the next day. However, the shepherds packed into the Edelweiss bar are clearly undaunted and determined to go ahead. I go upstairs to try to get some rest, but the noise of carousing goes on unabated until well after three o'clock, when the first groups of sheep are driven off towards the mountain. Othmar arrives before five, and we set off after them. Within an hour we reach the first two groups of sheep, having had to negotiate a sheet of ice where a stream, its course blocked by frozen water, has spilled over a wide area of the hillside and then congealed into a treacherous glassy slope. We now find ourselves on a vast wilderness of slippery scree, with deep hollows full of snow. An intermittent blizzard is blowing off the extremely daunting-looking mountainside that rears up before us. Our jackets crackle as though hit by showers of stones, and at times the gusts are so violent that it is difficult to stand up. The sheep don't like this at all and are proving well-nigh immovable, for all the relentless barking of the dogs nipping their heels, and the wild shouts of the staff-waving shepherds. Progress is agonizingly slow. Othmar and I do what we can to assist in urging the sheep forward, but with so much standing around my legs are now very cold indeed, conjuring up envious thoughts of the Iceman's cosy sheepskin leggings, and despite wearing two pairs of thick gloves I can no longer feel the tips of my fingers and thumbs. At last we start the ascent up a narrow path through the snow zig-zagging up towards the dizzying peaks above. There is less wind here, but keeping the sheep on the move is still a problem. Miraculously, it has stopped snowing, but getting up the mountain would certainly have been impossible had a team descending earlier from the Austrian side not spent several hours clearing a way through the deepest drifts. In places the path is near vertical and the advantage of having four feet rather than two becomes painfully clear, as I repeatedly fall and slide backwards. At one point I put my foot on what I take to be solid ground, but which turns out to be a ledge of ice that gives way, leaving my leg dangling in the void. Cursing my lack of foresight in not bring a stick, I numbly struggle on upwards, increasingly breathless and fatigued. From time to time the file of sheep comes to a grinding halt as those in front slip backwards or become jammed in some tight passage between rocks. During one of these pauses a panting sheepdog lies down at my feet visibly shivering. I know how it feels. The final part of the ascent passes in a slithering, gasping blur. But at last we reach the dazzlingly white slope that leads up to the 3000-meter Niederjoch, the so-called pass that looks more like merely a slight indentation in the mountain top. I stagger into the Similaun climbers' refuge, a large wooden hut just off the main path and manage to get a cup of tea at the kitchen counter to thaw out my hands, before a flushed-looking band of shepherds comes stamping in and gets stuck into drinking beer again - it is by now 9.30am. The following groups of sheep are now snaking up in a seemingly endless file below us, and some of the shepherds are soon on their way again, driving the animals on the four-hour trek across the glacier and snowfields to the pastures of Niedertal. It is minus 7C with a biting wind, and though the site where the Iceman was found is not far from the Similaun refuge, it is presently, I'm told, buried under several meters of snow and probably unreachable even on skis. While the sheep are still coming up it is impossible to make the descent, so it is not until over nine hours after we have first set out that we reach the lakeside at Vernagt again. After a farewell beer with Othmar before he sets off back to Bozen, I go up to my room, crawl under my duvet and fall into a dreamless sleep. I awaken a couple of hours later to the sound of the first group of returning shepherds (who, like us, went no further than the refuge), like Viking warriors back from a successful raiding party, raising a triumphant rumpus in the bar below. In 2001, almost exactly 10 years after the mummy came to light, Dr. Eduard Egarter and Dr. Paul Gostner examined a new chest x-ray and CT scan and detected an object embedded in the left shoulder of the mummy. It was a flint arrow head, which had severed several major blood vessels. Thus, having been shot in the back the Iceman appears to have bled to death. A deep wound in a hand and numerous abrasions suggest that the Iceman had been involved in hand-to-hand combat shortly before his death. Injuries to the skull indicate that he either fell or received a violent blow to his head.